In Netigate there is a pre-existing library of surveys and inspiration for questionnaires of different types. This library is free to use for anyone with a Netigate access. All you need is a Netigate user with permission to Create and edit surveys. How do I use the survey library? To use the survey library you will need to be on the start page of your Netigate account. 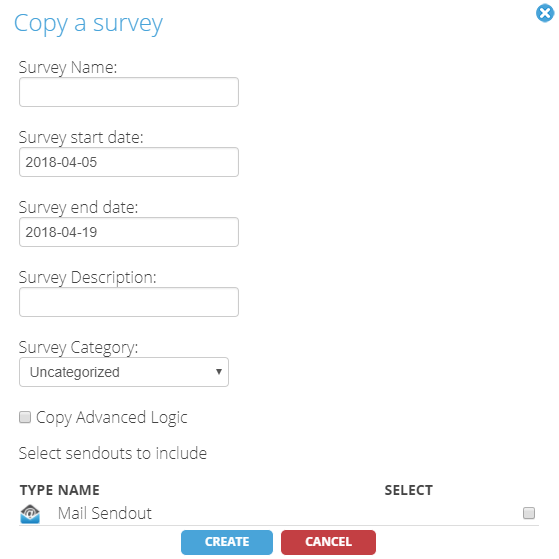 To access the survey library you will need to select Create a survey and then the option Copy a survey to create a new copy of the existing survey. At the top of the Copy a survey menu will show you My surveys which is surveys that are created by you or your organization categorized in the different folders that are set on your account. Below My surveys you will have Survey library. All surveys in this menu are part of the Netigate standard library. Note: Content in the library may vary depending on your company’s geographical location and language settings. In this menu there is general information about the survey with survey name and the language of the questions. You may click in order to preview the specific survey. Click the option Add this survey to select the survey that you wish to copy. You will get a new selection where you will need to enter the name, category and start/end date of the survey. The survey start date will be automatically set to todays date and the end date is set to two weeks later, but you can of course adjust these dates to match your project. In addition you will select whether you wish to include advanced logic (the possibility to copy existing skip, and hide-logic etc) and if you wish to copy an existing sendout you can assign that by marking the checkbox “Select” next to the sendout that you wish to include. What can I find in the survey library? In the survey library you will have three different categories: Voice Of Customer, Voice Of Employee and Market Research. These three categories is a distinction of what type of survey the template is created for. They can of course be used for other purposes as well but these are the intended areas of use. Customer Service Full: A more extensive questionnaire for Customer Service evaluations. Includes more questions and will take longer to respond to. You can preview the survey here. Customer Service Light: A compressed questionnaire for Customer Service evaluations. It is shorter and only takes a minute to respond to. You can preview the survey here. Churn: A survey designed for Churned customers to investigate the causes of the Churn. Primarily suited for SaaS companies that offer subscription-based services. You can preview the survey here. Anti-churn: Designed for passive customers in order to identify the challenges for your inactive users. Is there something that can be done to prevent the inactive/passive customers from becoming Churn? You can preview the survey here. Win/Loss: The purpose of this survey is to find out the reason why your prospects choose to become your customers, but also to find out why others decide to decline your quotes. The results will help you sort out what improvements you should make and what you should keep for the future. You can preview the survey here. Loss: Will help you find the reason why your prospects decide to decline your quotes. You can preview the survey here. Customer Satisfaction B2B: Customer Satisfaction Surveys are used to find out what your customers think about you as a supplier. Feedback from your customers will give you valuable insights to continuously improve your offer, increase customer loyalty and boost sales figures. Focus on B2B. You can preview the survey here. Customer Satisfaction B2B Light: A more compressed version of the Customer Satisfaction B2B. It is shorter, have less questions and will take less time to answer. You can preview the survey here. Customer Satisfaction B2C: Customer Satisfaction Surveys are used to find out what your customers think about you as a supplier. Feedback from your customers will give you valuable insights to continuously improve your offer, increase customer loyalty and boost sales figures. Focus on B2C. You can preview the survey here. Customer Satisfaction B2C Light: A more compressed version of the Customer Satisfaction B2C. It is shorter, have less questions and will take less time to answer. You can preview the survey here. NPS: Net Promoter Score (NPS) is the no. 1 measuring method when it comes to customer loyalty. It is popular for its simplicity and the benefit it gives. And you don’t have to analyse the results of a large and complex survey. You can preview the survey here. Employee 2018: Employee Surveys are used to find out what your employees think about you as a supplier. Feedback from your employees will give you valuable insights to continuously improve your work environment and increase employee loyalty. You can preview the survey here. Employee 2018 Light: The Light version includes less questions and have a much narrower focus than the larger Employee survey. You can preview the survey here. eNPS: eNPS uses the Net Promoter Score mechanism, which is a well-established metric for measuring loyalty. The central question for employee engagement is: “How willing are you to recommend your employer to a family member or friend?”. You can preview the survey here. Onboarding: An onboarding survey gives you the information you need to make sure every new employee receives all the relevant information and valuable input about how they perceived the recruitment process and their first impressions of the company. You can preview the survey here. Exit survey: Employee exit surveys give you the valuable information you need to improve your organisation as a workplace and avoid losing employees in the future. You can preview the survey here. Manager 360: Evaluating managers is a great way to get insights that can be used for both personal and professional development. 360 Degree Feedback evaluations are a method whereby the manager is evaluated from three levels: higher managers, same-level managers and subordinates. You can preview the survey here. Additional questions: Discrimination: A survey that focus on discrimination in the work-place. Discrimination is a collective term for several types of undesired behaviour. In everyday speech, we often talk about bullying, psychological violence or other forms of harassment, such as sexual harassment. You can preview the survey here. Brand Evaluation: A brand evaluation provides valuable insights for the development of your communication. By conducting an analysis of how your brand is perceived by the market, you can gain important information for e.g. repositioning, adjusting your message or target audiences. You can preview the survey here. Post-test Campaign: This survey measures the impact of your past campaigns (ads, banners, commercials, etc.). This template can potentially be adapted to a post-test to assess the effect of a release of eg new products or websites. You can preview the survey here. Concept Test Product: This study aims to investigate how a new concept would be received in the market. “Concept test” describes the launch of a new product, website, campaign or similar. Concept testing identifies the target group’s beliefs, desires and needs of a particular product or service, and contribute insights to enhance your product development and communication. You can preview the survey here. Political Opinion Poll (UK): An opinion poll is a survey of public opinion and is usually designed to represent the views of a population. Opinion polls are most commonly used for political purposes, but can also be used to find out how specific factors, such as e.g. the introduction of new laws or an urgent subject may affect your organisation. From a marketing perspective, opinion polls are carried out to find out what consumers think, for example about new products or services. You can preview the survey here. Course Evaluation: By examining the participants’ opinions on various aspects of your past course, you can gather important opinions and valuable information on how to improve your courses in the future. You can preview the survey here. Event/Course Registration: A signup form for Events and Courses. You can preview the survey here. Web360: With direct feedback you ask your visitor for their opinion at the right time – when they are on your website and it a qualitative complement to the quantitative data from website statistic tools such as Google Analytics. It is the most direct way to find out if your visitors are attracted by your design, message and offer. The purpose of the survey is to assure the quality of the website and gain insight into potential areas for improvement. You can preview the survey here.